In 2006 the business was sold to Gavin Johnson who was looking for a new challenge. 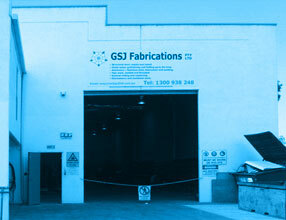 Now called GSJ Fabrications the business has thrived and enjoyed a constant but controlled growth, with hard work, determination and a lot of long days the business eventually out grew the factory in Katoomba, forcing the relocation to much larger premises in St Mary's. The business now employs around 14 fulltime working both in the workshop, or on site. At GSJ our aim is to offer the best possible service. We have the expertise and equipment to make us an excellent one-stop-shop for all your fabrication needs. We are able to offer a range of services including, galvanizing, powder coating, painting also engineering, drafting, laser cutting and many more. At GSJ we put a lot back in to the business such as buying machinery and equipment to help us provide an on time and quality service to all our clients which include, Goodman Fielder, Nestle, MacDonald’s Australia, United group, Transfield, Sydney water and many more. We are capable of providing services in many different areas of the steel industry which include Structural, sheet metal, pipe work and more. For the first half of the 2010 / 11 financial year we have out putted approximately 160 ton of structural steel which includes 4 schools in Coffs harbour as part of the BER project and 18 ton for a pre cast factory at Rutherford. We also carried out all the onsite install for all the jobs. All structural work is carried out to AS1554. We have put a lot of time and effort in to getting our own weld procedures and certification in place in order to meet some of the client’s requirements. We also have all required SWMS and risk assessments for site work. Some of our current projects include the manufacture and testing of stainless steel tanks which hold ammonia nitrate explosive for use in the mines. Manufacture and install of 3 stainless steel playground slides for the Darling walk project. The slides are specially designed and are the first of a kind in Australia. Building extension at Goodman Fielder bakery, we are extending the current distribution dock to allow greater storage. The dock will be an enclosed area to help prolong the life of the products with the help to two evaporative cooling units which we are also installing. Construction of approximately 25 waste room structures and carports, for Maincom constructions on their department of housing project. The White Rose, emblem of Yorkshire. It embodies a pride and a tradition that is second to none.